In general, this makes the whole interface feel a little heavy on the left side. This might be fine, but it was a little weird to get used to. When blocks are set to alignfull, the left border only appears on the block toolbar (unless you're on mobile, in which case it does not appear at all in this case). We can likely do some iteration on the thickness of the left border. I chose 3px to start with. As per @afercia's clarification in #14095 (comment), the blue color in our current hover state was not chosen due to accessibility concerns. Since we may have some flexibility on that color, I suggest we try a slightly lighter gray color for the hover indicator instead. As raised by @LukePettway in #13700 (comment), this hover treatment does not outline the entire interactive area. It also may be lost on very large screens. We should try this out and assess the impact of this. When scrolling, the left border of the block can overlap with that of the block toolbar. Since they're using opacity, the overlap is visible if you look closely. We may want to try preventing that. Add thick borders to the left of blocks when they're hovred + selected. Add thick left border to the page title. Turn off block toolbar centering for alignwide blocks. This splits the left border in two, which looks a bit weird. Move block breadcrump to the left side, position it on top of the block. Clean up the block toolbar's left border. Use inset borders on mobile. Prevent inset borders from overlapping with full-bleed content. ... I suggest we try a slightly lighter gray color for the hover indicator instead. It feels nice and light to me, negating a bit of the left-heaviness I experienced in the original PR. It does make the hover less prominent, but that may be workable. However, I'm like 80% sure there was a reason that the block name label was moved to the top right, instead of top left. I think it was blocking interaction with the previous block, or maybe causing issues with the adjacent inserter? I really appreciate the hover states not interfering with my view of the document as a whole. The heaviness on the left felt fine to me. Initially, I thought it might look odd with the quote block, but it seemed fine. I did notice some rough parts around the columns block, but what isn't rough there right now? Did you happen to test the a11y on the block label? Does the black on grey contrast work? Ah, good catch. Yeah, I need to adjust this for that block (and probably other blocks that support nesting, too). Yep, $dark-gray-900 text against a $light-gray-500 background has a pretty high 13.17:1 contrast ratio. That's actually a better ratio than what we have against the blue. @chrisvanpatten I don't recall anything specific for why the hover label was on the right, but it is important to note that in this PR, the label is shown above the block border, rather than within it. As long as the label doesn't remain on-screen when you hover over it, it shouldn't cause any issues with selecting the block above. The very first hover labels were horrendous. I can say that because I designed them, so I'm only offending myself. They were all sorts of in the way, covering sibling inserters and, yeah, it really helped making them small. I believe we moved them to the right with the intent of making them into the block drag handle. But since then, obviously, the actual drag handle has landed. On the left. So I think it's okay to explore moving that label around. @kjellr Thank you so very much for exploring this, head on. Building a block editor has definitely been a challenge, and although it's thrilling to see a thousand blocks actually blooming (this was always our greatest hope), along the way it's been incredibly arduous to try and find the right balance between being an editor, and being a block editor. I love that we are continuing to explore that, it can only improve things. In this case, I also deeply love how you state at the top what problems you are trying to solve with this: the heaviness of the UI, and at the same time the lack of contrast with the selected block. Having just played around with this a little bit in the branch, I feel you do accompolish the contrast issue, but that the heaviness is less successful. Like Mark says, it's nice for the document to feel continuous, but the wider border actually feels heavier to me than the border all the way around. It's hard to put into words, but it almost feels like the document is leaning towards the left now. But the ingredients seem right. Specifically the left border on hover, sans color. How would it look if the hover border remained 1px, but was $dark-gray-150 instead, and remained $dark-gray-150 when selected? and remained $dark-gray-150 when selected? @afercia Is that an "I'm interested to see how this would look" or a "This is probably a bad idea" thinking emoji? Thanks for the history @jasmussen. I agree it feels a little heavy on the left on focus. I like the thick border on hover for sure… less sure about the focus state. It's a thinking emoji. As in: it's basically what the accessibility feedback proposed since the beginning. As long as $dark-gray-150 gives a contrast of at least 3:1 with the background and it stays $dark-gray-150 without fading, the thinking emoji thinks it's interesting. FWIW I appreciated the line-on-the-side idea even in the early explorations even if not all the pieces had yet fallen into place, so this might be a good time. I also feel that this approach with the label on the left looks almost like that the label "expands" into the toolbar, which feels a subtle yet good correlation to me. Use a gray border instead of a blue one on hover. Give the PR another test and please share your impressions. I've opened #14197 with a version of this idea. It uses a $dark-gray-300 left border (I had to darken it from your suggestion in order to get the breadcrumb to pass AA), alongside $dark-opacity-200 borders for the focus state. I adjusted the borders so that they surround the block and the block toolbar, but do not effect the dividers inside of the toolbar. Compared to earlier explorations, I think this works nicely to retain the dark focus state, while keeping the icons strong enough to not compete with the borders. When exploring the "navigation / edit mode" in #3195 / #5694 at some point it was clear there was the need for a <button> element in each block to switch between the two modes. This exploration hasn't seen much progress in the last months but it still might be one of the things to try to improve the overall keyboard interaction with the blocks. There's a chance something like that might be implemented in the future and just wanted to mention the "breadcrumb" could be used as the button we need to switch mode. Just a consideration I wanted to share, nothing actionable here at the moment. I pushed a tweak to use a SASS variable to configure the size of the left border easily. I have a small preference for this approach personally. The darker border around the toolbars and the blocks seem odd to me as the inner border of the toolbar are lighter. Anyway, happy to go with what you all feel is best. Remove the left toolbar border on mobile screens. This fixes some visual bugs with themes like TwentyNineteen, which include margins on either side of the block on mobile. Yeah, I noticed that in Master too. 😕 I haven't looked into it yet, but I wonder if it has to do with Twenty Nineteen's editor styles. We can fix separately. I don't think we account for the hover state in master so this is technically not a regression. 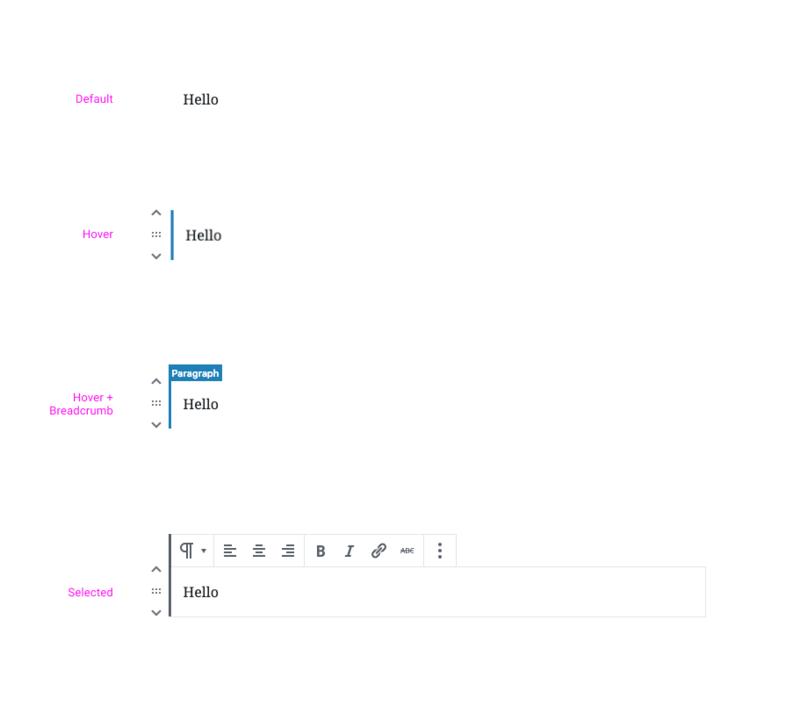 Can you think of a good way to make that hover state work better for inverted styles? If not, then it's not a blocker. I just noticed that the post title hover and selected styles are not great in "Spotlight Mode"
Oh I have blue outlines, maybe it's related to the branch I was in. Sorry for the ping, I'll check deeper. * Add thick borders to the left of blocks when they're hovred + selected. * Add thick left border to the page title. * Turn off block toolbar centering for alignwide blocks. * Move block breadcrump to the left side, position it on top of the block. * Clean up the block toolbar's left border. * Use inset borders on mobile. * Prevent inset borders from overlapping with full-bleed content. * Use a gray border instead of a blue one on hover. * Fix breadcrumb potision for alignfull blocks. * Clean up breadcrumb position for left & right-aligned blocks. * Sync block mover animation up with the hover state. * Darken focused block borders slightly. * Switch to using border instead of outline for block borders. Also, change the thick left border to a solid color, to prevent weird overlap. * Adjust z-index of border + breadcrumb for child blocks. So that they're not overlapped by the parent block's border + toolbar. * Remove extra z-index rule from the block border. Turns out this wasn't needed anyway. * Remove extra z-index rule from the block border. Minor description cleanup. * Ensure these styles are compatible with Top Toolbar mode. * Use the new gray value for the mobile toolbar border. * Add a matching left border to the post permalink area above the title. * Improve border position for mobile screens, especially for elements that float left/right. * Remove a couple unnecessary border updates from 047e1e4. Turns out these styles can be preserved on all screen sizes with no ill effect. * Clean up bugs related to the hover + focus states of the classic editor block. * Classic Block toolbar icon cleanup. Even out margins, remove white background. * Reusable Block border cleanup. * Keeping a light border on the classic block when it's inactive. * Clean up borders on warning blocks. 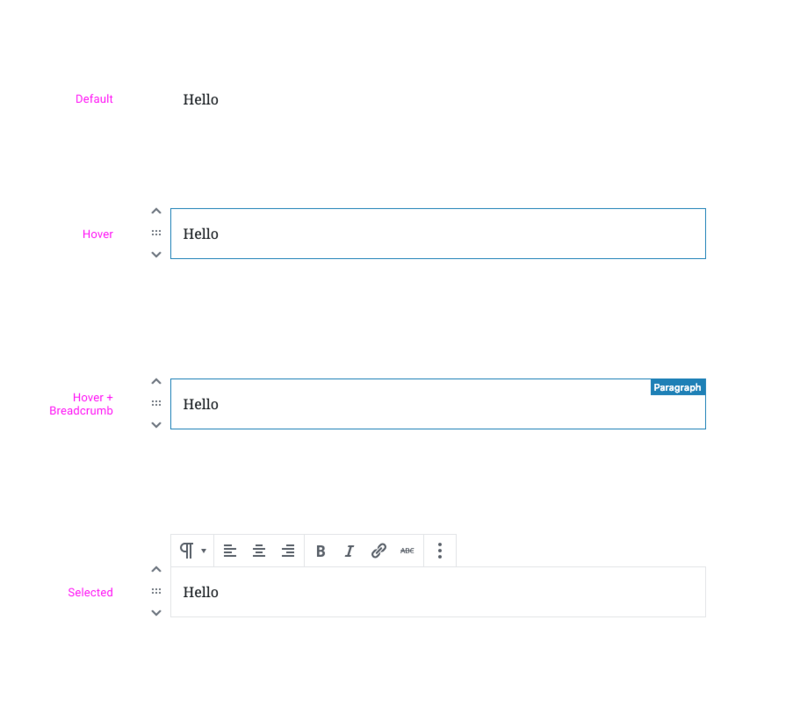 * Switch to a solid color border color for the permalink box. This mirrors the approach we use for block toolbars, and also ensures that we don't layer opacities and make the permalink toolbar darker than intended. * Update z-index rule name to match the one used in the latest merge. * Combine full-wide toolbar centering rules. Previously, these were declared in two separate palces. 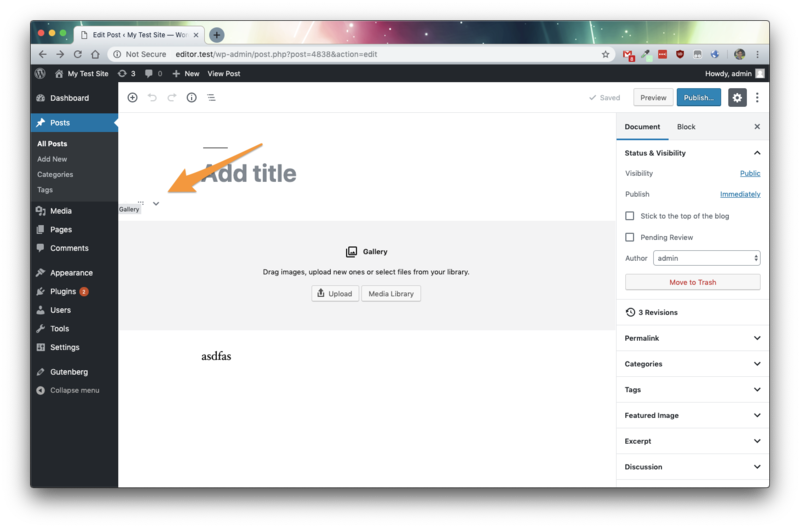 * Add a darker hover state for dark themes. * Remove the left toolbar border on mobile screens. It's a bit better, but still not user friendly. On testing I accidentally dropped a Kadence row inside a Kadence row and was wondering why I couldn't make the inner one go fullscreen. It wasn't evident what had happened until I used the document drop down to see where I had gone. 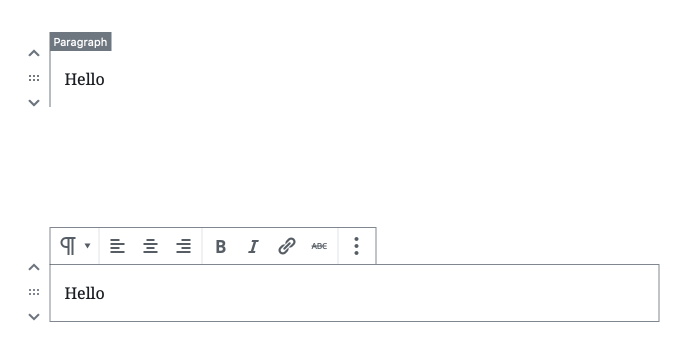 Then when I tried to move the row block down out of the outer row it stubbornly wouldn't nudge down the theme footer and ended up floating around after my cursor (with no click down on my mouse button). To resolve I had to scrap the rows and start over. * Implement same padding rules as used in columns block for container block. Ensures block mover controls remain visible. This is in response to the wealth of feedback (particularly from the Design team) that “Container” is not a good reflection of the purpose. Rather Section is the prefered option. * Resolve block validation error when custom background color used. Caused by customBackgroundColor not being defined as an attribute. As per this comment #13964 (comment) the Block needs the ability to align the blocks within the Section. Currently only a few Blocks support this but a wider change can be added that will enable all inner blocks to be aligned. 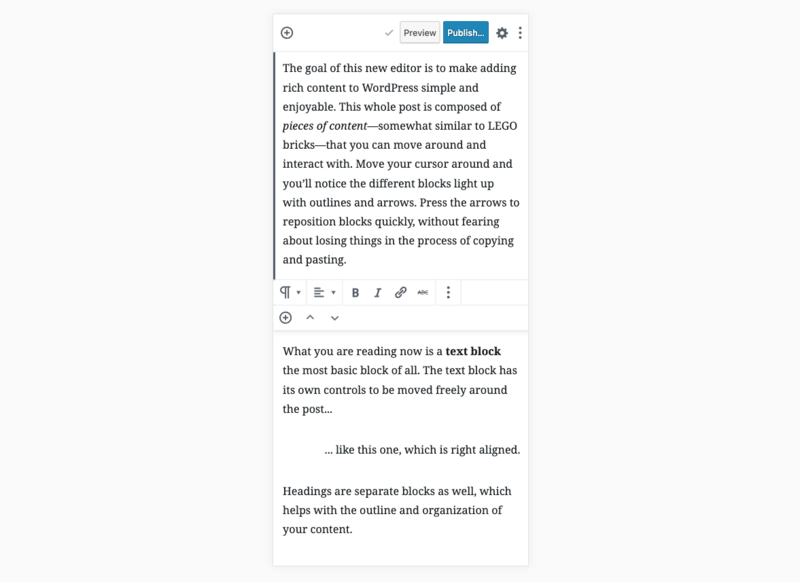 The alignment rules are tested against the [Gutenberg Starter Theme](https://github.com/WordPress/gutenberg-starter-theme) as this enqueues no editor styles and conforms to the guidlines laid out [here](#13964 (comment)). @kjell has noted that Twenty Nineteen will need a patch for this, the styles for which have already been scoped out. Note that this removes the previous fix for the block mover controls which are now (again) hidden when Blocks are full width. @kjell has confirmed this is a known issue that needs to be solved globally and should not be addressed in this PR. Remove padding to ensure alignment is consistent with canvas by default. Plan to introduce an attribute to control this later. Previously alignment CSS was too focused on images and had too many edge cases. Refactor to cater for all Block types and in turn simplified the CSS. Previously a 1px gap was seen on the sides of images nested within Section. * Fixes full width image alignment within full width Section. Alters values required to ensure full width image Block meets edges of editor canvas when within a full width Section Block. This removes the need for the “edge case” hack in the Image Block CSS which is good as this was never a good idea. Utilising width’s over 100% and negative left offsets were triggering hoz scrollbars. Also added a patch for the Block insertion point offsets which were triggering scrollbars due to their overhanging -1px indent. When the Section Block is highlighted so that the contextual toolbar is displayed it can cause hoz scrollbars to appear when the viewport becomes narrow. This is a very difficult bug to spot but careful testing will reveal it. The -1px compensates for the `left: 1px` value on the child element `.block-editor-block-toolbar`which is causing the scrollbar to appear. This was due to negative margins being applied too early. Turns out these were mirroring a rule already in place within the editor and didn’t need to be there anyway. Removing fixes the issue as the core rules are applied at the correct media query. When Section has a background padding is added meaning that full width child Blocks no longer span edge-to-edge. 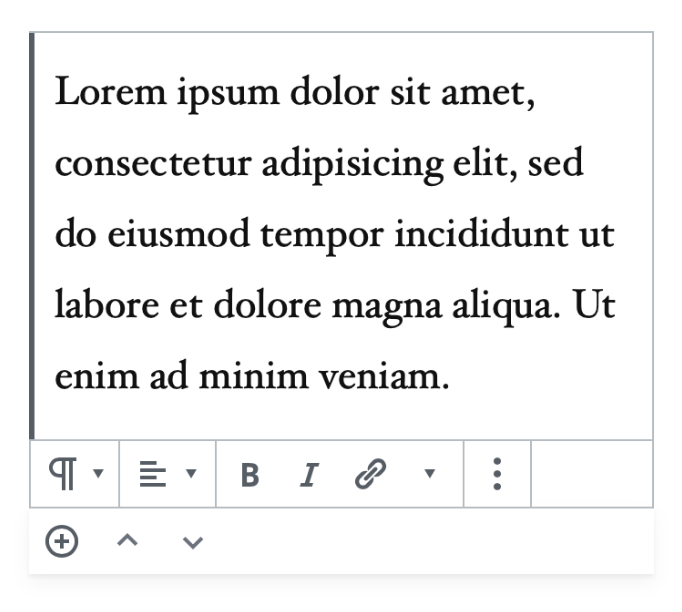 This fix adds a compensating factor to ensure an edge-to-edge layout within the editor. // Position hover label on the right for the top level block. // Position hover label on the left for the top level block. Should it be on the left, or on the right?